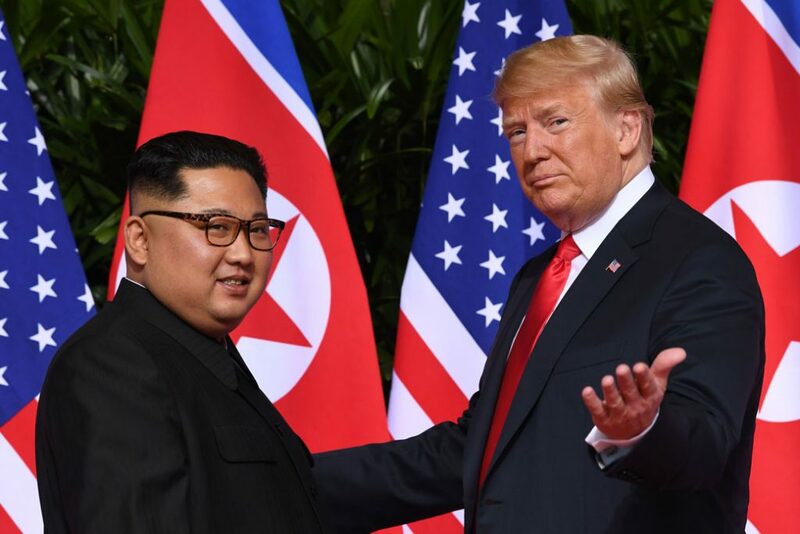 Since the Singapore summit, both sides have, on occasion, attempted to signal an interest in moving negotiations forward: The United States relaxed restrictions on humanitarian assistance to North Korea, while North Korea announced that it was prepared to close its Yongbyon nuclear facilities in exchange for “corresponding measures” from the United States. But diplomacy appears to have stalled. Despite Secretary of State Mike Pompeo’s two trips to Pyongyang since the June 2018 summit, the North Koreans have avoided real negotiations. Moreover, it was not until January 19 of this year that U.S. special envoy for North Korea Stephen Biegun finally met with his North Korean counterpart. As the second summit approaches, there are many questions up for debate: Will the two countries release a “peace declaration” as a symbolic gesture announcing the end of the Korean War? Will North Korea agree to any verifiable changes to its nuclear program? Will the United States lift any sanctions? In light of the tumultuous history of U.S.-North Korean diplomatic efforts over the decades, any promises that are made at the upcoming summit cannot be taken on North Korea’s word alone. With North Korea, the United States cannot simply trust; it must verify. Diplomacy is necessary. Over time, diplomacy is the only way that the United States can address the threats posed by North Korea. Regardless of whether it quickly results in the denuclearization of North Korea, diplomacy can certainly reduce tensions and the chance for miscommunication—both of which can lead to conflict. Over the past year, diplomacy between South Korea and North Korea has already led to a reduction of military tensions at the Demilitarized Zone (DMZ) between the two countries, as guard posts are dismantled and land mines are deactivated. A second U.S.-North Korea summit is unlikely to result in denuclearization; but it could begin a series of steps that reduces the threat from North Korea. However, the North Koreans continue to stall working-level talks and hold out for summit meetings because Trump is all too quick to give them away without concessions. The question is whether the ongoing talks constitute real diplomacy or are merely for show. Trump wants a good show. Unfortunately, the president appears thus far to care more about generating good headlines than making a good deal. After his first summit with Kim Jong Un, he claimed on Twitter that “there is no longer a Nuclear Threat from North Korea”; and Trump continues to advertise U.S.-North Korea engagement as a success. In reality, however, North Korea has made no commitment to back off from its nuclear ambitions and continues to advance its illicit programs. President Trump’s desire to claim that he has solved the North Korea problem is clouding his vision and thwarting his ability to do what is best for America and its allies. The president’s actions lead the North Koreans to believe that they can string along the United States without making real concessions. Moreover, Trump’s behavior is creating a rift between himself and the U.S. intelligence community—as well as allies such as Japan. North Korea continues building more nuclear weapons and missiles. Since diplomacy with the United States began last year, North Korea has taken no concrete actions toward denuclearization. While North Korea paused missile and nuclear testing months before U.S.-North Korea negotiations began, it has only taken superficial and easily reversible steps—such as dismantling the Punggye-ri test site—to make it appear as though it is serious about ending its nuclear program. Today, North Korea has greater nuclear and missile capabilities than it did when it began diplomatic efforts with the United States and South Korea in 2018. Trump could sell out America and its allies. There is also the very real possibility that Trump makes a deal that is good for North Korea and bad for America. Trump has long made clear his disdain for the United States’ alliance with South Korea, and North Korea has long attempted to undermine this alliance. If Trump agrees to a deal that lets North Korea off the hook for its nuclear weapons program and, at the same time, hurts U.S. alliances, Americans will be less safe. For example, he could announce a withdrawal or drawdown of American troops in South Korea without first consulting Seoul, all in return for vague North Korean promises. Trump has already shown a willingness to act in this manner. At his press conference following the Singapore summit, Trump surprised both his advisers and South Koreans by announcing that he was suspending U.S.-South Korea military exercises. This pledge was something that North Korea had long demanded and, furthermore, was not on the list of negotiated outcomes. Any talk of declaring an end to the Korean War—a long-discussed potential outcome—must carefully be coordinated with U.S. allies in Seoul and Tokyo, as there are legitimate concerns about how North Korea could use such a declaration to criticize the ongoing U.S. military presence in the region. Throughout it all, Trump must work closely with ally Japan, which is under direct threat from North Korea and is deeply concerned by the current nature of diplomacy with North Korea. The United States must test North Korean intentions. While Americans should be skeptical of whether or not North Korea is willing to change its behavior, the United States must test its intentions by engaging in good faith negotiations that include making genuine offers to change U.S. policy toward North Korea. Therefore, it should approach the talks in a way that gives North Korea the opportunity to take tangible steps to reduce the threat it poses to the world and the American people. By making genuine and pragmatic offers to North Korea—such as an end-of-war declaration or support for economic cooperation between North and South Korea—the United States can make clear that it is willing to change its relationship with North Korea, but only if and when Pyongyang responds to U.S. demands to verifiably change its behavior. However, if North Korea is not willing to, it should be clear that any lack of progress in talks is because of North Korean intransigence. The United States must focus on human rights and humanitarian concerns. While the Trump administration once highlighted the plight of the North Korean people, it has also imposed harsh restrictions on the ability of nongovernmental organizations (NGOs) and others to provide desperately needed humanitarian assistance in North Korea. Despite a recent move to loosen those restrictions, President Trump has stopped talking about human rights in North Korea, and humanitarian access to the country and its people remains low. Regardless of where diplomacy goes, Trump must ensure that humanitarian organizations can access North Korea—a move that would also signal further U.S. flexibility in the ongoing negotiations. Ultimately, there is no way to know if a deal can be struck with North Korea. Still, in order to test what is possible, President Donald Trump must engage in real diplomacy—not reality TV diplomacy. He must stop simply believing that North Korea is changing its behavior and start verifying that it actually is. Michael Fuchs is a senior fellow at the Center for American Progress. Abigail Bard is a research associate for Asia Policy at the Center.